Hill describes important battles and the order’s social and military milieu. 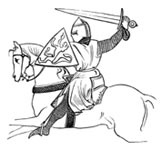 The weaving together of needs both warrior and religious was codified; for example, the Templar’s Hierarchical Statutes specify, “The Master [of the order] should have four horses and one Chaplain brother, one clerk with three horses, one sergeant brother with two horses, one gentleman valet with one horse to carry his shield and lance.” Hill also includes sketches and photos of building floor plans and other architecture, battle formation, and common images of the military order (such as their battlefield standards), which greatly aid in understanding the attraction of the Knights to medieval society. As promised in the book’s title, Hill is at his best when analyzing military conditions and tactics. Hill repeatedly reminds readers of the harsh conditions of the Near East and Iberian Peninsula, including not only battlefield realities but logistical practicalities, such as the vast quantities of hay and water needed for the knights’ horses and beasts of burden. Hill quotes Jacques de Molay’s sober if unromantic hesitation to rush headlong into a crusade to recapture the Holy Land after the fall of Acre in 1291: “The land itself is so unhealthy and harsh that it would be a miracle if a force of 4,000 strong, healthy knights could muster 500 survivors at the end of the year.” More such citations from major actors and chroniclers of the time would have been welcome. Throughout the book, small boxed asides provide background facts on various individuals and groups. For instance, the brief aside on Gualdim Pais, Master of Portugal from 1157 to 1195, reads, “The founder of the Templar castle and city of Tomar…. His stalwart defense of Christian Portugal throughout his long career won him admiration even after the Templars were disbanded.” Hill’s coverage of a large quantity of information is the flip-side of the book’s weaknesses: political aspects are given only superficial attention; not much is learned about the leaders of the Templars, aside from the last — Jacques de Molay, burned at the stake by the French king in 1314 — and most individuals mentioned seem but bit players in a sweeping narrative. Moreover, Hill gives only cursory attention to the theological issues and religious devotion that led to the crusades and military orders in the first place. Notwithstanding these lacunae, Hill piques one’s curiosity in the medieval intermixing of the sacred and the profane and whets readers’ appetites for more on the Knights Templar and on the crusades in general. Adorning the cover of George Weigel’s Fragility of Order is Pieter Bruegel the Elder’s harrowing depiction of St. Michael the Archangel driving Lucifer’s rebellious angels from Heaven. This primeval disruption of divine order engendered our exile from Eden and subsequent search for human order in a chaotic world. It is also the archetype by which we must understand order — and its disintegration in many areas — in our own day. The book’s title adds its own dynamic tension, for order (family, Church, government), despite its durability, is fragile. It requires individual virtue and communal vigilance. It is a gift but never a given. Existential threats to order, such as the twin tyrannies of individualism and totalitarianism, have wreaked devastation on our present age. These threats demonstrate that the preservation and renewal of order neither begin nor end with politics. Preservation of order is at its core a religious endeavor that undergirds culture and politics and — as Weigel makes clear — should be informed by, and be a reflection of, the divine order. The Fragility of Order is a collection of 13 essays Weigel presented as lectures or published in magazines. At first glance, the essays appear disparate and unconnected. The book begins with an essay called “The Great War Revisited” and ends with a discussion of the Poverello of Assisi entitled “Evangelical Churchmanship.” In lesser hands, any connection might be muddled or lost, but Weigel writes crisply and with purpose; he knows what he wants to say. Connecting the essays are Weigel’s observations on the possibilities of order in America, the world, and the Catholic Church. And while each has challenges particular to its role in the life of man, the necessity and continuity — by no means certainty — of order is Weigel’s preoccupation. His concern is “one of diagnosis, not prescription.” Though Weigel does offer suggestions, he is careful to avoid the siren call of plans and programs that mars so many books on our cultural moment. The remedy for a civilization heaving and creaking under the weight of distorted understandings of human freedom and the inevitable accompaniment of the will to power is not found in a PowerPoint presentation. Weigel is best at discussing Christianity in the public square. Two essays, “The Importance of Reality Contact” and “A New Great Awakening,” provide trenchant analyses of the moral and cultural fault lines in America. But he doesn’t merely describe how we wandered into this dark wood; he sheds light on the path back. The task is simple but not easy: offering Christian joy to a country hell-bent on human pleasure. Weigel’s essay on Pope Benedict XVI’s 2006 Regensburg address — a well-reasoned attempt to engage the colliding forces of Islam and a postmodern West — is excellent in correcting the errors of a hysterical media. But Weigel misses the mark by locating the roots of Islamic violence in jihadist ideology. It is the same error that marred his 2009 book Faith, Reason, and the War Against Jihadism. He assumes that jihad of the sword (there are other types) is an aberration or irrational misinterpretation. It is neither. That many Muslims do not wage jihad of the sword does not mean it is not Islamic doctrine. The doctrine is there, waiting to be acted upon. Weigel further supports his argument by pointing to the irrational violence and “distortions of the Gospel” during the crusades, for which he claims the Church has repented. But it is arguable that Pope St. John Paul II’s “Day of Pardon” in March 2000 was an apology. More significantly, Weigel’s view is not in keeping with crusades scholarship: Jonathan Riley-Smith argues in The Crusades: The Essential Readings that contemporary sources viewed crusading as an act of love, and Christopher Tyerman definitively demonstrates in How to Plan a Crusade that the crusades were rational. Furthermore, Weigel’s hope in an Islamic reckoning with the Enlightenment is misplaced. As Robert Reilly shows in The Closing of the Muslim Mind, that way is shut. As large an issue as Islam is to the Church, it is a small thing against Weigel’s achievement in this collection of essays.